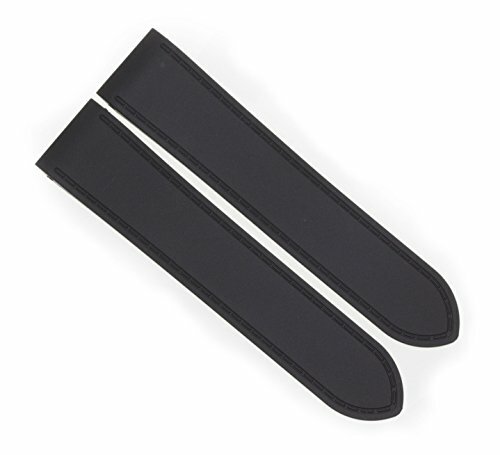 23mm Black PU Rubber Strap Diver Watch Band Fits CARTIER SANTOS 100 XL Non-Chronograph by Vintage G.
Width: 23mm at the Case Lugs End and 21mm at the Buckle End. Thickness: 7.5mm (Lugs End) 1.3mm (Buckle End) - Thickness Exactly Same as OEM Cartier Strap All Specifications are exact as OEM Cartier Santos 100 Leather Strap Guarantee to Fit your Cartier Santos 100 Watches. We also carry PU Rubber Strap in 24.5mm for Santos 100 Chronograph Model. All Parts and Accessories Sold By Vintage G Workshop Are Aftermarket. Vintage G Workshop is an Independent Company and is Not Affiliated with any Watch Manufacturer or Distributor. If you have any questions about this product by Vintage 1946, contact us by completing and submitting the form below. If you are looking for a specif part number, please include it with your message. 24.5mm Kevlar Toile Leather Strap Watch Band Fits CARTIER SANTOS 100 XL Chronograph by Vintage G.
23mm Black Grain Leather Strap Watch Band Fits CARTIER SANTOS 100 XL Non-Chronograph by Vintage G.